Join Friends of Sutter’s Fort a talk by special guest author, Gregory Nokes taking place in the Distillery at Sutter’s Fort State Historic Park. During the talk, Nokes will discuss his newest book, The Troubled Life of Peter Burnett. The Troubled Life of Peter Burnett explains this complicated man who was handed extraordinary authority in both Oregon and California, yet proved unable to exercise it. Space for this speaking event is limited and registration is required. Friends of Sutter’s Fort members receive free entry, but must reserve spot in advance. Non-members and guests can purchase tickets in advance. Reserve your space today! R. Gregory Nokes has traveled the world as a reporter and editor. He is author of three non-fiction Western histories. 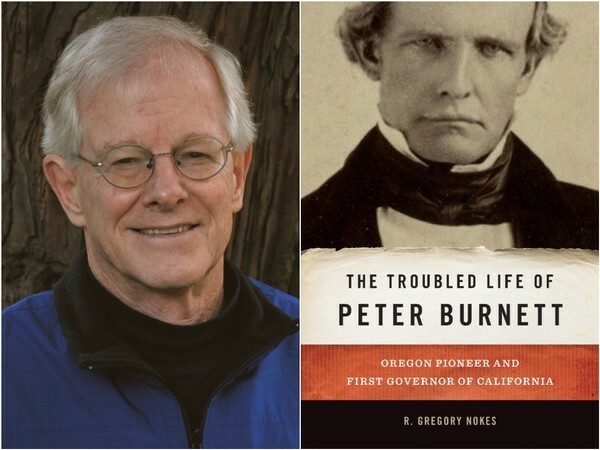 His latest book is The Troubled Life of Peter Burnett: Oregon Pioneer and First Governor of California, published this year by Oregon State University Press. His earlier books are Massacred for Gold: The Chinese in Hells Canyon in 2009, and Breaking Chains: Slavery on Trial in the Oregon Territory in 2013, both also published by OSU Press. A native of Oregon, Nokes did his undergraduate work at Willamette University. He attended Harvard University as a Nieman Fellow in 1971-72. Nokes and his wife, Candise, live in West Linn, Oregon.